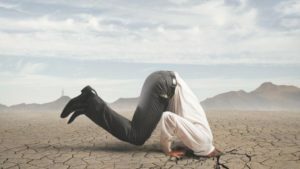 Getting organised for the future – Don’t stick your head in the sand! It’s all very well drawing up a will and Lasting Power of Attorney and thinking that is all you have to do to prepare for the future. If you do not keep proper records of what you own then you make it so much more difficult for your attorneys or executors to sort out your affairs and correctly identify all your assets when the time comes. Over the years so many family members have come in to see me to sort out an estate and then rather sheepishly produced six plastic carrier bags stuffed with correspondence going back decades! Not only does this lead to a delay in applying for probate but it could also cause other problems. When the second spouse dies there are now transferable inheritance tax allowances to be claimed. Any inheritance tax liability on the second death is due for payment within six months after the end of the month in which the death occurred. Given the tight time constraints if the details are held this will save costly interest and penalties on the inheritance tax. Chatting to a lady in the gym recently she told me that her mother went into residential care several weeks ago. When I asked whether in her role as attorney she had notified the buildings insurance company that her mother’s house was now empty she said no and began to panic. I advised her to do this right away since the current insurance policy will not remain valid if the insurer is not advised within the required period that the house is empty. If my friend cannot find the insurer’s details immediately it will be harder to take the necessary action within the time frame. Usually this is only 30 days so time is short. Then of course we all live in an age when so much information is stored electronically and a search of the house will not necessarily unearth all of someone’s assets and policies. People living alone who do not have family may be members of clubs and organisations who will need to be informed of their death. When someone dies or becomes mentally incapacitated there will be online accounts to be accessed and pages like Facebook closed down. Those hard earned store loyalty card points can be claimed on death by the beneficiaries of a will. If these details are not known big companies like Boots and Tesco will keep your card points. Being in full possession of all financial details is important especially at a time when family members are too emotionally wrought to think clearly. When drawing up wills at Cognitive Law we provide clients with advice on the information that is needed to avoid these pitfalls and make the estate administration a smoother, quicker process.